So I guess the relevant background info is that Orcs are similar to vikings in this setting, and raid on boats from the sea? Yeah.. actually, regarding invisible feedback everyone has received, is there any more information that could be made public? For instance, I would be curious exactly why the Hunters have gotten such a bad reputation. What you tell us doesn't even have to be true, really. But I'd just like to know what the common people think, at least. Currently the only Orc population of note resides far to the East. Doctor Feelgood did a little world building of his own to help create his backstory and I helped him figure out the logistics of how Orc raiders might get so far West. I wouldn’t say all Orcs are pirates or that all pirates are Orcs, just this raiding party. The bad reputation comes from a series of different reasons. They are a nearly forgotten relic of an Empire that isn’t fondly remembered, their business revolves around the occult and supernatural which makes folks uneasy, some religious sects aren’t particularly pleased thinking them to be the very cause of the calamities, their reputation for stealing kids even if it’s a legal contract, people fear what they don’t understand. The lack of information is kind of intentional and serves a twofold purpose: 1) To let the players world build without worrying too much about constraints (if it’s too far off the beaten path I can correct). 2) It’s representative of both the isolation of Ludevine which is tucked away in the corner of the continent, and the countries at large that have grown more insular as the Empire collapsed in on itself. Alright, well I'm really sorry if I keep asking questions, but usually the response is, "I want you to be free!" I like how we can have more freedom to create content. I'm just curious is all. I had an idea which might be good, or it might be terrible. Could those orcs be so far east that, in fact, on a world shaped like a globe they are actually more accessible by traveling west? the main continent is huge so perhaps, one would have to ask the Orcs . In all earnestness though sea/air travel becomes more difficult the farther from the main landmass that you travel. Strange weather and freak storms discourage travel too far from the coast, so if someone has tried and succeeded in finding a way to go west by heading east they are not sharing. Don’t worry about asking questions, questions are great. I like questions, they advance the story. Last edited by Mrjoegangles; 03-28-2019 at 08:15 AM. If you want far eastern orcs, I’d say we could argue for it. I rolled with the idea of pirates because I liked the thematic association of a North Sea type background for a disinhibited Wild Rager. My mind actually had a more Icelandic feel, similar to the old Viking slavers who would raid Ireland. I think in this case far eastern merely describes their location on a continent but nothing to do with culture. It seems I already guessed correctly about the viking thing. Who knows? Would be cool if some of those orcs knew a sailing secret to go east to west, raid, and then leave with impunity. Last edited by DrowNinjaPrincess; 03-28-2019 at 10:32 AM. Laarth is not yet an adult, but you would not know this from looking at her. Tall for human society, but at 5'10" she's very average for her stronger bloodline. Her build is muscular, that of a toned athlete. Her light green skin is without blemish, bar the patterned scars upon her face and shoulders. Many stare at these, but they are beautiful to her and bring her the luck of the gods. Her hair is almost as confrontational as her face, with sides shven to keep it practical and a flash of red through what remains. There is no desire to be discreet and unseen, which is self evident not only in her appearance but also from how she carries herself and the body language of confidence. 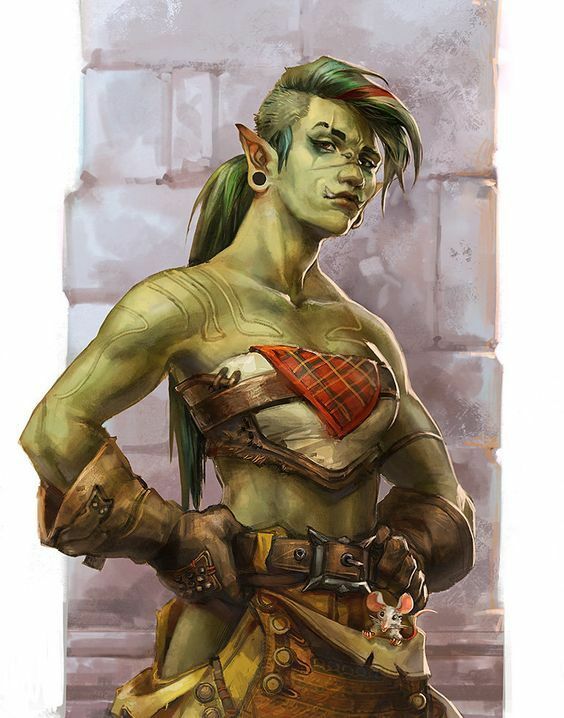 For a Half-Orc she is surprisingly caring, especially of the weak or exploited. Having grown up the oddity, Laarth has a great deal of empathy for those living experiences like her own. Laarth grew up in a small town in the shadow of Tusk, the great peak! Bannaegcombe was a simple Human dominated town, where she stood out like a sore thumb. Yet Laarth would fight, fight those who'd challenge her as best she could. She was different from most so she was normally the first target amongst her peers and the more 'normal' citizens. She was no stranger to fighting, to being falsely accused. Yet there always comes that one fight too many... that time you really hurt someone. It doesn't matter that she thought she was fighting for her life, or the years of torment she'd endured. She was different... she was the one at fault. It was after that when it was decided the best option was to sign her up to service for the citadel, to the hunters. She would not be allowed to stay within the town, saving face for her family and satisfying those affronted. If anyone could amend her deviant and rash ways, it was thought them, and if she fell in the process. Well, that was also a problem resolved. Turning her back upon her family was far from easy to start with, despite being angry at them and her town for judging and mistreating her so. Yet now she has a new family and a new home. The only part of her past that she holds on to with any real meaning is the faith of her home town, a farming community that prayed to, sacrificed to, and beseeched Gozreh the sky father. The same sky father that continues to believe in her, and did not turn his back. His gifts and blessings bringing great power to a young Half-Orc girl. Fortunately for the Hunters she bonded well with the cause and the ideal of protecting the weak from monsters. Her energy and strength given a focus, her qualities recognised and herself respected as an equal. Laarth had found direction, purpose, and faith. Whilst not the model student her own personal progress was considerable. Last edited by Kweheri; 03-31-2019 at 06:05 PM. Still got two segments to go but wouldn't mind thoughts on the current direction. Can't say it's a bad story, though I don't know how it conflicts with the idea that no one really trusts the hunters anymore, or how orcs are from the far eastern part of the world/continent. Final week, push forward with those apps. You got until this weekend to ask your questions and put in your requests for world building. Very excited with the applications already put forth, a lot of great ideas and character concepts to look at. Can't wait for the speech, "everyone's character was fantastic and the decision was very difficult, but..."
Oh yeah. And if anyone is planning on moving or going to a new job soon, or going to have a kid, or will suddenly have to drop because exams are coming, etc etc, better speak now and get that out of the way! Sorry, wasn't sure I could make this concept stick mechanically. But I got something figured out. Personality: Known for getting her hands where they don't belong, Jaelin is as mischievous as she is charming. She carries a Calistrian symbol and acts out her faith in tricks, petty thievery, and a complex web of budding love affairs. Though she's known for trouble, she sticks to things she can talk her way out of. As such she's begrudgingly loved by most of her close neighbors, a fact which she exploits without shame. She's self-serving and hardly heroic, but she also loves to be on everyone's good side. She'd rather talk (and flirt) her way to a life of comfort than to work for it. And thanks to her parents' hands-off approach she's managed to skate by without getting her hands dirty up to this point. Background: Jaelin is the daughter of a petty lord to hear her tell it. Actually she's the daughter of the lord's guard, but she has no trouble currying favor within the court. 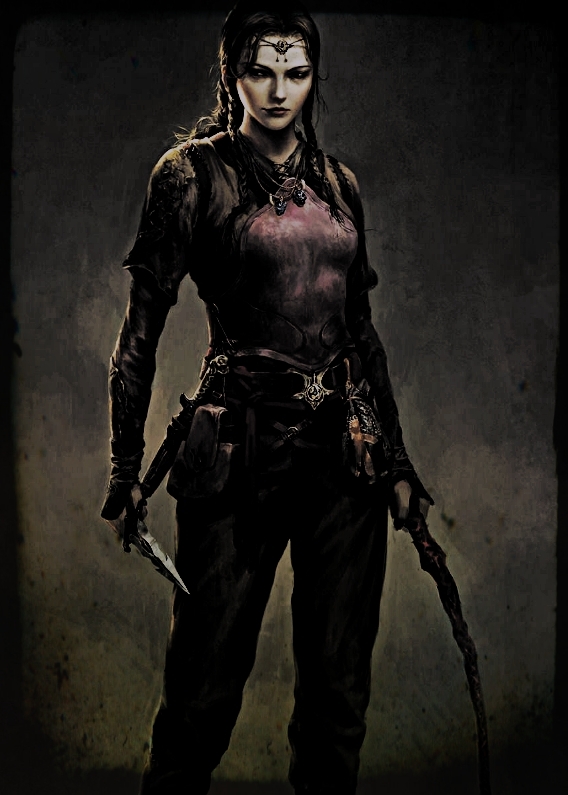 She's learned a little bit of fighting from the guards and a little bit of smooth talking from the courtiers; she's learned a little bit of thieving on her own. She's also gathered some formal education from the school in the temple of Calistria. Though she's an only child she's never been especially close to her family. Her parents are usually occupied with court affairs and largely let her manage herself. She isn't terribly sure if they even like her, though it's not something she really thinks about. When she's not taking classes at the temple she mostly occupies herself with petty diversions such as larceny, courting lovers, or even fencing with her friends in the yards. Being from Traversk, though she fancies herself the picture of high society sophistication, she's spent her share of time playing around the mills and marinas that make up the larger part of the economy. Her obsessive grooming serves to counter the effects of a life lived as much outdoors as in, and the seamstress is a family friend by now. But that's simply life in Traversk; far from the fineries of the capitol, though it could be regal enough in it's own way. The Departure: The night she was sold, she'd come home late from a long day of mischief and revelry. Before she even reached the threshold she knew something was amiss. It was like the air was colder, and the home belonged to a stranger. She hesitated before trying the door, doing her best to shake off whatever shadow hung over her just then. But when she opened the door and stepped in, despite the fire in the hearth, everything became colder. Her parents sat by the fire, both looking up at the dark figure. It was a man she'd never seen before, and as her gaze tortuously explored the room, it finally landed upon his face and her eyes met his; a chill ran down her spine. The sum was handed off and she had but a moment, full of confusion and disbelief, before suddenly finding herself a homeless traveler, a purchased companion of some mysterious person. Finally she worked up the courage to speak, to try to understand some fragment of her knew life, so suddenly and remarkably different. Last edited by AlphaZ; 04-07-2019 at 05:49 PM. Appearance: Turok has the look of a predator. His dark hair and feral black eyes are often enough to give most opponents pause. The many weapons arrayed on his person give even more warning of a person ready to fight. Though not an imposing figure at 5' 6" and a solid 150 lbs, Turok has an almost tangible presence that often fills in what he lacks in physical stature. Personality: Turok is quick to anger and slow to trust. He is fiercely loyal to friends, and he only counts those who he has fought beside worthy of the title. The Hunter saved him, so he believes he owes the man a debt that he may never repay. One day, he hopes to return to his own people, to avenge his father and brothers and claim the title of Chieftain. But first he must prove himself worthy. Background: Couple paragraphs, describe your life prior to the Hunter’s appearance at your front door. Feel free to ask questions if you want specifics about locations and such, I don’t mind if you guys want to build a little in my sandbox for background though so don’t be afraid to craft your own story. Biography: History: In the small clan of barbarians that Turok calls kin, size equals power. Being something of a runt, it was a miracle that Turok survived long enough to see his first birthday. Had he been anyone but the son of the cheiftain, and he probably wouldnt have. Outsized by all his brothers, Turok had to become agile and daring. While others could beat him with brute strength, he often matched them with speed and guile. The greatest challenge of his life came on his 15th birthday. The day that his father, Malak, was to name an heir, the clan's greatest warrior challenged Malak for leadership. The younger man, called Kath Bearkiller, was in the prime of life and had amassed much honor in the eyes of the younger barbarians of the clan. Malak had no choice but to accept. Turok watched as his father readied for battle, standing with his three older brothers next to their mother and 4 sisters. His eldest brother informed him that if Kath won, he could claim their mother and even them as his own wife and children. Or he could put them out of the clan. There was a third option, as they soon discovered. Malak fell to a mighty swing of Kath's greatsword. Turok was the first to speak. He looked boldly at Kath and said, You have killed a great man. Something in the boys tone stung the giant warrior. He turned to the assembled clan. I claim the wife of Malak as my own. His daughters are mine to raise as my own. He turned back to the male children. These boys are nothing, and unfit to continue their line. He raised his greatsword. I will cleanse them from our midst. The eldest was the first to act, he died attempting to draw his own blade. The other two turned to run, only to be killed by Kath's own sons, eager to please their father. Turok already held his axes at the ready. One took the throat from one of Kath's sons, opening a route of escape. The other was flung at the new chieftain. Kath only partially dodged, losing an eye and gaining a great scar across the left side of his face. A dozen warriors scrambled to seize the youth. They could not overtake the boy as he deftly used the brush, trees and streams to confuse his pursuers. Kath caught sight of Turok as the boy scrambled up a cliff too steep for his larger warriors to pursue. I will drink your blood, boy. Run far and fast. Never will You find rest, lest it be on the end of my sword. Turok ran, for ten days he ran, before he collapsed. Dirty, tired and half-crazy from thirst and hunger. It was there that The Hunter found him. Last edited by KevinFipps; 04-05-2019 at 02:03 PM.